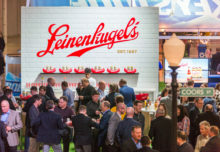 It’s one thing to engage consumers in a campaign message. It’s another to weave them into the fabric of one, literally. 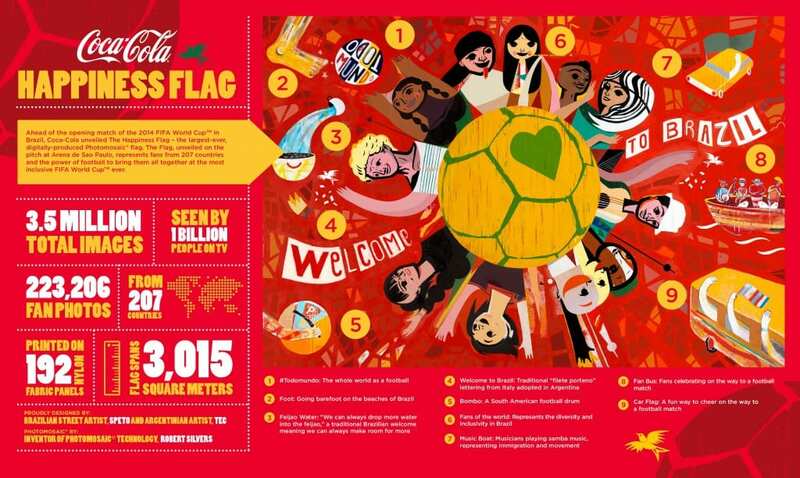 For its global sponsorship of the 2014 FIFA World Cup, Coca-Cola harnessed the power of social media to create The Happiness Flag—a 3,015-square-meter digitally produced photomosaic flag made up, pixel by pixel, of fan-submitted photos and tweets. “The concept behind Coca-Cola’s campaign is very simply ‘The World’s Cup’—this notion that wherever you live and whoever you support, you’re invited to join the celebration of the 2014 FIFA World Cup in Brazil with Coca-Cola,” says Brad Fields, licensing manager, The Coca-Cola Company. Here, a look at how the pieces of the program came together. 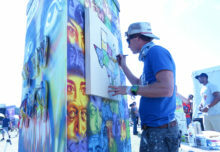 Coca-Cola kicked off the campaign last September, leveraging social media and happinessflag.com to invite and collect submissions from consumers. 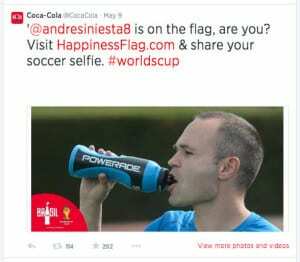 The brand customized the process and terms-of-use regulations across countries, but on the whole, Coke promoted the process with calls to action like “share your soccer selfie” on social media with links to the website for a submission and approval process. 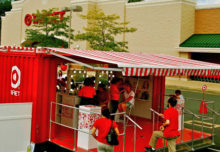 In addition, on the Coca-Cola-sponsored World Cup trophy tour consumers were encouraged to take their photo with the trophies for the flag (Atlanta-based ignition ran point on the campaign). In a few countries, Coca-Cola sent out photo teams to the far reaches of the landscape to collect images of soccer fans in their element to put toward the mosaic. Arguably, the biggest rivalry in soccer is between Brazil and Argentina, so to celebrate competition in its truest form, Coca-Cola enlisted Brazilian street artist Speto and Argentinian artist Tec to create the flag design. Robert Silvers, inventor of the Photomosaic technology, of Runaway Technology, Inc., handled the pixel placement. Images were selected individually by color, and enhanced as necessary. Flag production company Geka, based in Germany, created the flag in four big rows, so that submissions could keep coming in through May. (The process in full would have taken 40 days to complete, and Coca-Cola didn’t want to interrupt the momentum of the campaign in April.) Made from 192 nylon fabric panels, the Happiness Flag contained 3.5 million images total, including 223,206 fan photos from 207 countries. 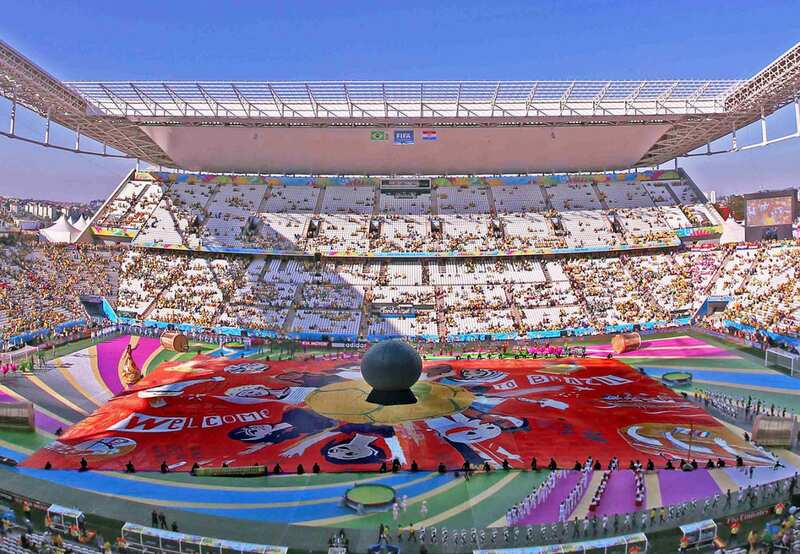 The opening ceremony at the FIFA World Cup is not commercially sponsored, but Coca-Cola was able to unveil the flag stretched out across the stadium field at Corinthians Arena in São Paulo just before the ceremony took place. As the show began, the flag peeled away with a “Kabuki” effect. An estimated 1 billion people viewed the flag on television. 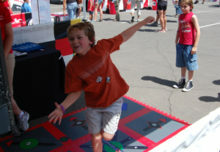 At happinessflag.com, the digital version of the flag is searchable by zooming in. But consumers who submitted photos can search for theirs specifically through a login on the site. Coca-Cola plans to divide sections of the flag to be sent to many of its global markets to be used in activations across the world, and it has been able to leverage video content of the flag’s creation process across its social channels.